We got off the boat in pretty short order and had a day to ourselves as the plans were to leave via JetBlue Tuesday morning and drive back to our plateau to get back before 5 in the p.m. I had wanted to see the Wolfsonian and/or other galleries/museums in Miami during this last day. But as we were standing in the parking lot of the Port of Miami with a high bright sky above us and a strong breeze, it didn't make sense to do anything but outside stuff. 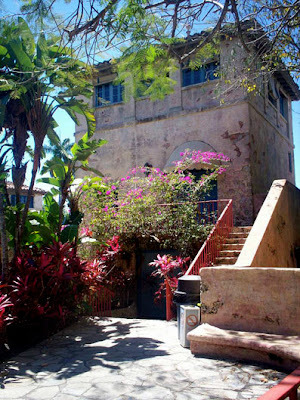 So we shifted our plans to do a rubbernecking tour of Coral Gables through Little Havana with the highlights of the Coral Gable's George Merrick's masterpieces. Who is George Merrick? Let me start by saying that Merrick along with the aforementioned Mr. Fabulous, Morris Lapidus are central to making Miami the jumpin' architectural joint it is today. Also, if you mix well--adding equal parts of Merrick's planning and vision and Lapidus, as visionary and designer, take out the wonderful proportions and scale that they so beautifully understand and send through the blender with Mary Blair and the Disney team of the fifties, you have the Disneyland ethos. To be perfectly candid, Merrick's Coral Gables and Lapidus should have been the design altars that the Disney "imagineers" worshipped at prior to even picking up a pencil because both of these geniuses understood the idea of immediately appealing to their audiences while setting a tone that you could have been transported to another place. In the case of Lapidus, it is way out there...in outer space, but with Merrick--it is closer and more understandable/relateable in concepts like Spain, China, France and exaggerated to the point that if you don't "get it" there must be more wood between your ears than most of us. So back to "Who is George Merrick?" George Edgar Merrick (1886-1942) was a real estate developer who is best known as the planner and builder of the city of Coral Gables, Florida in the 1920s, one of the first planned communities in the United States . Merrick was born in Springdale, Pennsylvania. His father, Solomon G. Merrick, was a Congregationalist minister. The family moved to Miami, Florida when George was 12 years old. He attended Rollins College in Winter Park. In October, 1915, George Merrick was appointed by the governor of Florida to replace F.A. Bryant as the county commissioner in District 1. He spent the next 15 months on the commission championing the building of roads in South Florida, including major arteries that would later serve to connect his well-planned community of Coral Gables with the fast-growing city of Miami. Along with Commissioner Edward DeVere Burr of Arch Creek, the two men ushered the vast majority of all road construction projects in Dade County, including the construction of US 1, the Tamiami Trail across the Everglades, the Bay Causeway to Miami Beach, Ingraham Highway (later known as Old Culter Road) along the coast, the Miami Canal Highway and many others. These improvements allowed the population of Dade County to quadruple from 1915 to 1921, transforming a pioneer territory into a burgeoning metropolis. Beginning in 1922, on 3,000 acres (12 km²) of citrus groves and land covered in pine trees which his father had left him, Merrick began carving out what he would call a "City Beautiful". He designed the new town in great detail, featuring wide, tree-lined boulevards, delicate bridges and sedate urban golf courses. Merrick's secret was his passionate devotion to aesthetics. And, just remember, he too, was born in Allegheny County...making him a Pittsburgher. 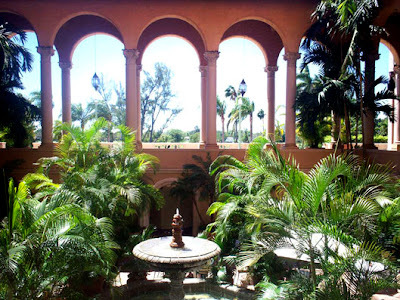 In the midst of one of Coral Gables' residential neighborhoods, hidden behind pastel stucco walls and wrought iron gates, is found one of the most special attractions of this special city - Venetian Pool. Perhaps the only swimming pool anywhere to be included in the National Register of Historic Places. Certainly it is the only swimming pool of its kind with its vine-covered loggias, shady porticos, spanish fountain, three-story observation towers and cascading waterfalls that spill into a free-form lagoon complete with coral rock caves and palm-fringed island. Even now, Venetian Pool would still put a twinkle in George Merrick's eye, as it did so many years ago. Fed by underground artesian wells, Venetian Pool was once a quarry pit, its only value being limestone it produced for the construction of that time. Through the creative efforts of Merrick's artist-uncle Denman Fink, and architect Phineas Paist, this eyesore was transformed in 1924 to what was then called Venetian Casino. During its heyday gondolas plied its waters. Esther Williams and Johnny Weismuller of Tarzan fame swam its length. The orchestras of Paul Whitman and Jan Garber serenaded pool side dancers as they swayed beneath the stars on outdoor terrazzo dance floors. Bathing beauties by the hundreds promenaded across specially constructed walkways, while visiting dignitaries passed through the circular aquarium room entry to tour the "world's most beautiful swimming hole." They often listened to three-time Democratic presidential nominee William Jennings Bryan deliver speeches for his annual fee of cash and Coral Gables real estate. Unfortunately, the pool is closed Mondays and they had it drained. Nonetheless, it is spectacular to see...perfect proportions, tropical plantings with mature plants everywhere, bouganvilla spanning wonderful covered walkways and the mimicry of real nature with the pool was evocative. It is wonderful it is still in use--and protected by the National Register as this sort of this is only imitated these days..but not the full magilla done so well. We visited the Congregational Church. It is situated on center from the Biltmore almost implying that one gets married here and strolls over for the reception...made even more real by the organist whaling on the organ practicing the classic wedding tunes and pieces traditionally played. 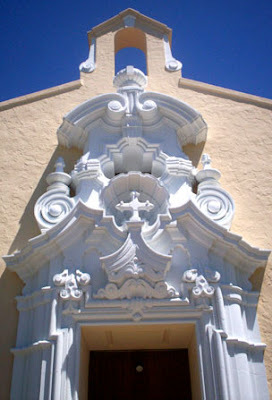 As you can see from my picture, The simple stucco building against the blue sky is one thing and then when you apply the icing of spanish style decoration at 200% (at least) scale...it is way over the top. The church was locked so we didnt get a gander at the inside. We were quite content with the facade and bell tower. We then strolled over to the Biltmore which is truly amazing. Perfect shape. More spanish influence with these lovely orange walls that change color with the shadow and sunshine really describing the forms and elements of the design. It appeared to be a little walled city from the street. To go through the front door to a darkened, must have been at least 3 story lobby, spanned by dark beams and detailed with dark woodwork (almost ebony) that peeks through to the courtyard at the back...surrounded by large balustrades and a multistory collinade complete also with large beams--but painted with a geometric pattern much like the ones I have seen in Italy. Lush planting on the outside. Cool and austere in the inside. Framing the main entrance to the Biltmore and on the way to the doors to the exterior collinade, two wonderfully large (10' at least)finch houses were on display with custom made drapery framing each side to give the birds protection from the stiff breeze that was happening. There were these little portholes one could look in though to see the birds nesting in their grass houses.